VIRGINIA BEACH, Va., (October 11, 2018) - The heavy rains and strong winds associated with tropical storms can quickly reduce visibility and create dangerous driving conditions on area roads. AAA Tidewater Virginia reminds motorists to take extra precautions when driving in any volatile weather. Prepare your car in advance. Before the rain hits, replace windshield wipers that streak or don’t clear glass in a single swipe; make sure headlights, taillights, brake lights and turn signals are properly functioning so other drivers will see you during downpours; make sure vehicle is up-to-date on vehicle manufacturer’s maintenance recommendations including tire tread depth and tire pressure. Don’t drive distracted. Adjust mirrors, seats and other settings before your start the vehicle. Also don’t’ be distracted by mobile devices, music, eating or other passengers. Avoid hydroplaning. Driving in other vehicle’s tracks can improve traction and help you avoid hydroplaning. Drivers of four-wheel drive vehicles must remember they are not immune from hydroplaning on wet surfaces. Keep your windshield and windows clean. It’s important to clean the inside of your windows. If the glass gets foggy, open a window slightly and turn the defroster fan to a higher speed. Use your air conditioner to reduce humidity. Drive with your daytime running lights or low-beam headlights on at all times – especially on dark or overcast days. 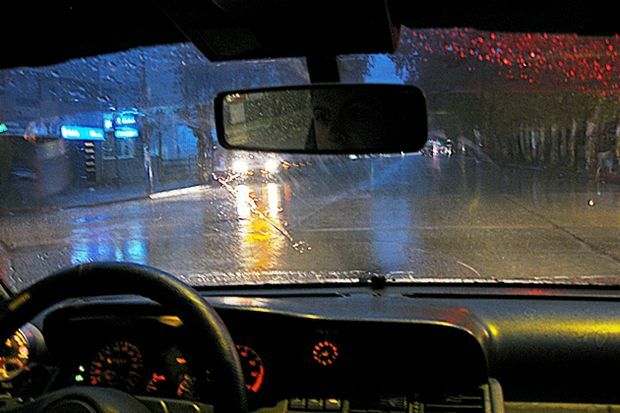 Avoid using cruise control in wet weather driving conditions. When used in wet conditions the chance of losing control of your vehicle increases. Sudden braking often leads to skids. Stopping on a slippery surface requires more distance, so increase your following distance. Focus your attention as far ahead as possible – at least 20 to 30 seconds. Give a truck or bus extra distance.